Labor Neunzehn will conduct a workshop about the project “All Sources Are Broken” in the context of the conference publishing strategies in post-truth times. 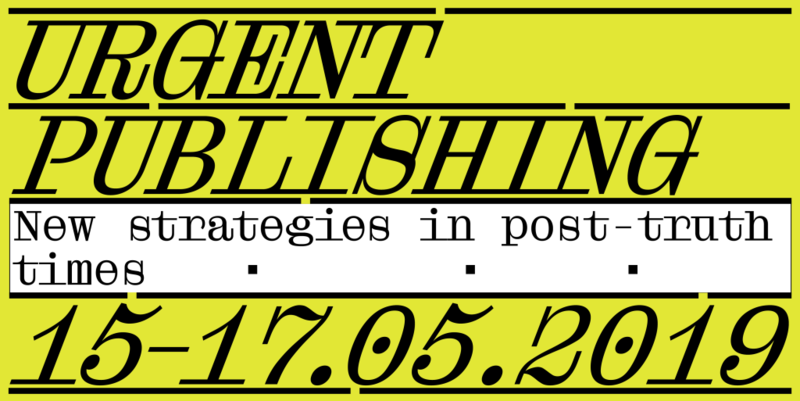 Organized by Institute of Network Cultures, ArtEz University of the Arts and Willem de Koonig Academy : “Urgent Publishing” will take place from 15 to 17 May in Amsterdam and in Arhenm. Admission: free, but registration is required. What is needed is a break with the old, closed pre-digital era of gatekeepers or high entry costs. Publishers, writers, researchers, designers and developers need new strategies for urgent publishing. A critical set of discourses, practices and productions to intervene in the public debate with high-quality information that can be issued in a timely manner and that will reach the desired audiences. The development of such a toolbox of strategies has been the focus of diverse critical cultures that have interacted and experimented with publishing in the last two decades. Concentrated efforts directed towards furthering these practices within the context of the current information age will open up robust futures for a publishing domain that remains forever emergent – and urgent.